Millions of children under the age of 5 get the flu each year. They get sicker from it than people of other ages. Complications caused by the flu can result in some children being hospitalized. In fact, the CDC estimates that in the past eight years between 7,000 and 26,000 children younger than five have ended up in the hospital from flu-related complications. Tragically, the flu can also be deadly for children who are not vaccinated against it. The CDC says that the majority of children who died from the illness – estimates range from 37 to 185 in any given year since the 2004-2005 season – were not vaccinated. Children with chronic illnesses are especially vulnerable to the flu. Those with asthma, weakened immune systems from cancer or medications, heart disease or those who take aspirin regularly should be vaccinated every year. Children with kidney disease, diabetes, blood disorders, and neurological disorders are also vulnerable and should receive the flu vaccine for protection. The American Academy of Pediatrics (AAP) has issued a formal recommendation that every child over the age of six months receive the flu vaccine to provide “optimal protection against all strains of influenza, a serious illness resulting in a record number of pediatric deaths during this past year” (2017-2018 flu season). 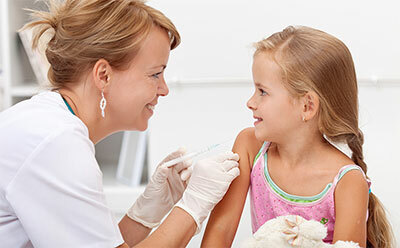 The AAP recommends that children receive the injectable form of the vaccine because it offers the “most consistent protection against all strains of the flu.” Some people prefer the nasal spray form of the vaccine but the AAP and the CDC report that it did not offer protection against the flu in past years. Therefore, it is not recommended as the primary form of the vaccine. The flu can make young children very sick. Hospitalization can be frightening for them, even in the best hospitals, and difficult for families. It’s best to do everything possible to keep young children healthy and protect them from illness. When it comes to the flu, vaccination is the first line of defense.